You will be building a stronger cohesive community by creating new play areas where families, particularly young people can interact and socialise with each other in a purposeful way. As our priority we will be regenerating the play parks for all ages and mixed abilities and building a new MUGA. Older children and young people are often hard to reach when it comes to social inclusion the introduction of a MUGA, and play parks will provide much needed facilities for them to use and meet new friends. The multi use games area will be located in the unsightly derelict car park that separates Military families and the local community and both play parks will engender a ‘sharing culture’ between both communities. If this funding is not available then some of the equipment proposed will not be made available reducing the effectiveness of the play areas. In particular it may increase the need for children to walk through unsafe secluded woodland areas and walk considerable distances in order to use other facilities. If participants were also not playing in the park, they would be playing on the roads. The development of these play areas will enable families to build social cohesion and closer communities both within the service family community and the wider local community. We will get this project done by employing a firm that has sprung up from the closure of the British steel industry. A successful outcome would be to provide an outdoor multi use games area that fits all ages but in particular for older children’s usage and two state of the art play parks that are stimulating for all ages. Improve the relationship between all the residents in the local community by encouraging a sense of sharing/community identity. A better quality of life for those who access the facilities. The provision of the funding will enable the full vision to be realised in terms of the play area equipment. This will satisfy an urgent need to support the families based at RAF Halton and the surrounding areas. 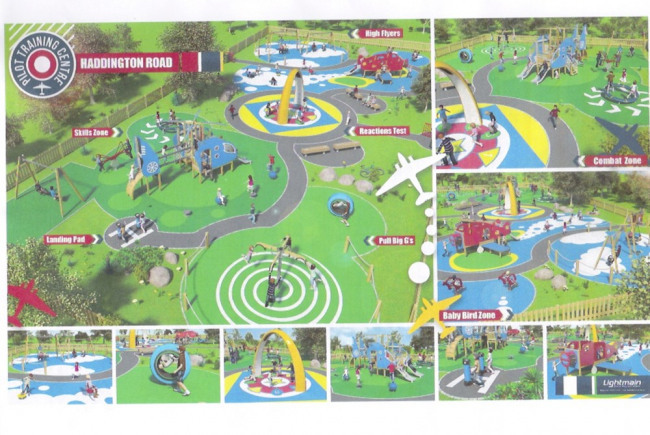 RAF Halton, is situated in the Wendover/ Halton Parishes and whilst the play parks in Halton have had the enjoyment of new play facilities the ones in Wendover have not. Princess Mary gate site has a newly built play park but has been designed for younger children (aed 10 years and under) therefore our projects seek to also address this issue by providing quality play for all, in particular older children. If this funding is not available then some of the equipment proposed will not be made available reducing the effectiveness of the play areas. In particular it may increase the need for children to walk through unsafe secluded woodland areas and walk considerable distances in order to use other facilities. If participants were also not playing in the park, they would be playing on the roads endangering lives. The development of these play areas and derelict car park with a MUGA will enable families to build social cohesion and closer communities both within the service family community and the wider local community.